The HTC One is a phone built on precision. It’s a brand realising it made a pretty much perfect phone with the One M8 and doubling down on its greatest strength to try and win over more customers. It’s dropped the maligned 4MP Ultrapixel sensor, bumping it up to a huge 20.7MP option in a bid to attract those that feel safer buying a phone with higher numbers on the spec sheet. And it’s tied off the experience with a huge boost in the engine room and teamed up with Dolby to refine its already powerful BoomSound experience. Even the battery capacity is improved, something HTC has struggled with in the past – now it’s beating Samsung’s Galaxy S6. So has the Taiwanese brand managed to do the almost impossible and create yet another perfect device? It’s certainly charging for it: the One M9 isn’t cheap. In the UK it’s going to be £580 SIM free for the handset, with a good £10 per month extra on contract. Early US price has it at around $650 without subsidy – which is only a rough price, but seems slightly out of kilter with the UK. This will go down, but it seems this phone has had to have a price increase to facilitate the improved design and uprated innards. HTC has kept the microSD slot for extra storage, and boosted the internal spec to 32GB to ensure issues of low memory should be a thing of the past. The internals are impressive: an octa-core Qualcomm 810 chipset, 3GB of RAM, 2840 mAh battery on top of a Super LCD3 screen. It’s not got the cachet of Samsung’s Super AMOLED display, but it’s still colour rich and seems close to the glass, which is important for image quality. There are some things that haven’t improved though: the screen is still “only” 5 inches, which could be too big or too small depending on your opinion on the subject. The resolution is “only” 1080p, but again, some are questioning whether the pin-sharp QHD resolution is needed, especially as it’s harder on battery life. The metallic chassis is back and is bolder than ever. It’s a two tone design (well, the Silver/Gold and Gold/Pink versions have a contrasting band around the side, whereas the Gunmetal Grey and Gold on Gold versions don’t) that uses a single piece of metal for the entire phone – it really feels better packaged. However, the key question remains: is this package good enough to warrant the extra cash? Have the improvements added more to the mix or is HTC just treading water, adding nuance rather than innovation? Let’s get this out the way at the start – the design is, by far, the most amazing part of the HTC One M9. HTC is calling it “jewellery-grade,” with each one hand-finished by craftsmen, and it certainly shows. The one-piece fascia is complemented beautifully by the two tone metallic rim (on my review unit, the silver and gold variant). The grey and gold versions will look less impressive, given they’ve lost the two-tone appeal, but that doesn’t mean they won’t be as nice to hold. Actually, I’m pretty sure they’ll be nicer than this model. There’s something about the design right now that I really don’t like, the rear edge proving to be quite sharp in the hand. It’s not going to draw blood, but when I used the gunmetal grey preview device in Barcelona it definitely felt closer to the One M8 in style, with more of a comfortable curve. The reason for this hasn’t been confirmed by HTC, but I get the feeling it’s something to do with the colouring process. The other thing that’s changed here – and not for the better – is the power button transferring to the right-hand side of the phone. The microSD slot is right above the trio of buttons too, and as it’s slightly indented can cause confusion when trying to change volume in the pocket. It’s hard to tell which is which, even with the phone in your hand – the extra ridges on the power button don’t help enough. 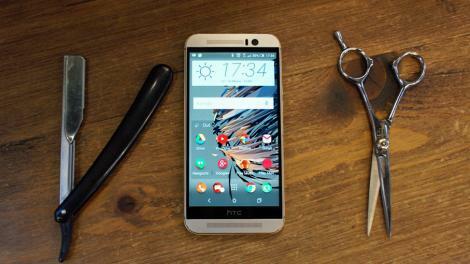 While the decisions HTC has made to improve the One M9’s design don’t seem to have hit the mark, there’s no doubt this is a finely crafted phone, and is probably the best on the market in that respect. The two-tone finish is superb, the weight and balance is even better than before, and the precision I spoke of earlier is the overriding feeling. The sharp edges of the BoomSound speakers are well-defined, and while it’s heavy at 157g, especially compared to the iPhone 6 or Galaxy S6, Apple’s is the only device that can come close to beating the attractive packaging here – and I prefer the weight and balance HTC has created. One thing HTC gets lambasted for is the extra space around the screen, with people saying the HTC logo doesn’t need to be on there, surrounded by a black bar that many think is there for show. It isn’t. It’s packing screen components that have to go somewhere as HTC has extended the length of the One M9 through the need for decent audio chambers to pump out BoomSound – and I’d rather have the powerful speakers than an identikit smartphone. The M9 is actually a little smaller than before, despite having the same 5-inch screen as last year. In fact, it’s an identical screen to last year’s model with a 1080p SuperLCD display covered in Gorilla Glass. There are undoubtedly performance improvements, but like last year, HTC is being cagey about them. What is apparent is the screen’s colours are rich, the gap between glass and display is low and the response under the finger is noticeably sharper. The screen’s 441PPI is perfectly sharp and doesn’t really offer a lot less than the QHD screens that are starting to flood the market. Well, more not so much “flood” as “gradually drip,” but they are coming. The only functional reason I can see to stick a super-sharp display into a screen below six inches in size is to allow for virtual reality headsets, which magnify the screen and can cause pixelation. However, HTC isn’t using the phone as the base of its VR Vive headset, so there’s not really any need here. The 5-inch screen is a fraction smaller than the competition on the market right now, with many other brands choosing to go 5.1-inch and above – but again, 5 inches seems like a fine choice here. There’s a fair amount of bezel on the One M9 compared to phones like the LG G3 and the Galaxy S6, and that’s more pronounced due to the extra metallic lip that’s running around the edge of the phone. But we don’t need edge to edge displays unless that’s what the phone is about – and HTC’s model is geared towards feeling more ergonomic in the hand, so it seems to suit the device. Thinking about what’s changed with the One M9 is where you’ll realize that HTC has hit a roadblock when it comes to innovation. For a brand that’s been so heavily into bringing something extra to the smartphone table – think BoomSound speakers, the duo camera, finding a way to get phone signal through an all-metal body – there’s very little to shout about here. It’s disappointing, given I’ve become used to HTC being the go-to brand for cool new ideas – making the same phone as last year with a little more polish has left me a little deflated. And yet the phone costs so much more than in previous years – it’s even more than an iPhone 6. Perhaps that will drop soon as the market stabilizes, but for now it feels like the brand is asking for more just to get a slightly more refined design. What’s better than hearing things? Hearing them in three dimensions of course! And that’s just what HTC says it’s done here, adding Dolby support to its BoomSound speakers (both with and without headphones connected) to create a virtual surround sound. What this seems to mean in the real world is that the phone can now pump out sound for “theater” or “music” mode, and further improve the sound quality when you’re listening to tunes over headphones. HTC has also created its own range of earbuds to allow you to get the best out of this optimized sound too, taking advantage of the extra power for your ears. HTC has gone bold and ditched the Ultrapixel camera for the new One M9 – well, ditched it from the rear anyway. Last year’s sensor is now used on the front of the phone; with the low light ability making selfies looks much better. The rear camera is now a 20.7MP affair, a very similar sensor to the one found in the Sony Xperia Z3 (although made by Toshiba). It’s been heavily revised, and now offers a much sharper image for those that like to zoom into photos. It’s lost a little of the low light ability, and colors are more muted, but overall is a much sharper and more competent sensor. The HTC One M9 is powered by Qualcomm’s new all-star Snapdragon 810 chipset, which is offering two sets of four cores (with only one set ever working at any one time), clocked at 1.5GHz and 2GHz. That’s backed up by 3GB of RAM, and this combination results in a very fast experience under the finger. It’s not perfect still, as Android Lollipop still seems to get in way when doing things like pressing the multi-tasking button and letting the phone lag. Like a lot of things on this phone it seems that it’s fine when ‘warmed up’ – pressing the multi tasking button will lead to a pause the first time, but press again and it’s instant – but the first load is slow. And there’s the issue of heat. HTC has been subjected to some bad press in the build up to this review, with the insane power of the 810 chipset meaning you can really run this phone hot through benchmarks and gaming, although not to the levels being described thanks to recent software updates. In reality, the phone does get rather warm at times thanks to the metal body dispersing heat more evenly, and while it’s clear the Qualcomm chip is running to a higher temperature it’s nothing massive. The battery life on the HTC range has always been something to keep an eye on, as I’ve always found it rather ‘slippy’. That means that even doing general tasks like browsing the web or checking football scores will munch down battery life a little fast. The One M9 has tried to eradicate that problem by using the Snapdragon 810 chip (which can use a lower power set of cores to get you through the less taxing tasks) as well as whacking in a massive 2840mAh battery, which is only fractionally smaller than the one used in the iPhone 6 Plus. It’s even bigger than the same one used in the Galaxy S6, and combined with the lower pixel count should enable HTC to get a better battery life out of its flagship range. Except, well, it doesn’t. You can read more about this in the Battery section of the review, but HTC still seems unable to build a light interface that doesn’t eat power when you don’t want it to. Looking at the statistics it seems that Android updating certain Google services is the main culprit, which is something usually associated with early software, so future updates might solve this. So it’s an OK battery life for HTC, and one that might get you through the day, but it will be close – and it’s worse than the battery life on the One M8. Here’s a big win for HTC: the base (and only) level of storage on the phone is 32GB, which means any apps that need to be kept on the phone’s internal memory can do so happily without leading to the dreaded ‘delete apps to free up space’ message when you need to take a picture or download new software. There’s also a microSD slot on board to allow you to get more storage in there as well, with the upper limit of 128GB bringing the total available to 160GB for your One M9. It’s worth remembering that putting loads of extra info into the phone via memory card can have an impact on performance, so don’t chuck too much on there that you’ll need to use regularly as it will slow the phone down somewhat. Sense has been overhauled again for the new phone, with the new version coming with a few little tweaks – although it really looks very similar to the one we got last year. The big changes are through themes and the gallery, with both having a marked effect on the way you personalize your phone. The theme generator is actually pretty cool: take a snap of anything, the phone will analyze the image and create a full palette of colors to use with icons and app headers – plus the font and icon shapes will be altered to match the overall ‘ethos’ too. You can choose different styles if you’re not completely happy with the way the phone’s suggestions work – but it’s a very holistic way of making a picture work throughout the phone. Cloudex sounds like stock broking software, but it’s the new way of organizing pictures on your new phone. It allows you to draw from Facebook, the One M9’s internal gallery and others to give you a complete look at all your snaps in one place. It takes a long time to sync up at the start and can munch battery if you’re not careful (make sure uploading through mobile data isn’t tagged, as this takes a lot power when you’re snapping around) but does give you a more rounded view of all your photos across cloud and local services. One of the interesting things about phones from the last two years was their ability to track fitness, the idea being that they’ll always be in your pocket and therefore will give the best amount of info. Despite partnering with Fitbit last year, HTC decided it needed its own version of a health tracker: HTC Fun Fit. It looks like you’ll need to download this though, which is a shame – especially when you see some of the pre-loaded apps on the One M9 that I could live without happily. Then again, Fun Fit doesn’t seem like there’s a lot of point to it for a number of reasons. Firstly, the rise of the fitness tracker has shown us that the phone is only so good for tracking steps, as it’s not always in the pocket and therefore might not get all the data. Secondly Fun Fit seems very limited beyond giving you information on what you’ve done in terms of steps taken or time spent running / walking. It’s also a little useless, giving wildly incorrect results when working out how long you’ve been running for. As part of a larger app, this stuff is great – and I love the cartoonish avatars, the ability to instantly sync up with friends using the app on Facebook and the different levels of activity on offer as you trot around through the day. However, there’s no end game here with HTC’s option. No training plans or motivation to do more – so who’s this for? The average non-exerciser will idly look at it, intrigued by their stats at the start, but with no motivation to go further. It’s a good app in that it’s well-designed, but that’s about it. The Sense interface on the HTC One M9 is still one of the most cultured and sophisticated around – far better than Samsung’s TouchWiz and far more powerful than iOS – and with the addition of Android Lollipop it’s been given another boost forward in terms of functionality. There are still a lot of swipes needed to get around, which may put some people off, but it’s simple to pick up and rewards you for playing with lots of subtle tricks. The interface hasn’t really been overhauled that much in the last year, and given most of the updates below will be coming to the HTC One M8 (and possibly even the M7) it seems like the reason to get them on the current model is slightly limited. That said, they’re still great ways to drive through the phone, and the nimbleness of the Snapdragon 810 chip means most of the touches are buttery smooth and quick. There are still pauses, judders and stumbles though, which I don’t expect in a phone of this level. I’ll be honest here: I’m a fan of Blinkfeed, but I’ve barely used it on this review device. I only remembered it was there after a couple of days of using the phone, and even then I found the motivation to go through and set up all my favorite sites wasn’t something I wanted to do. There’s something about Blinkfeed that’s not evolved in the way I wanted it to, even though I was promised two years ago it would become really intuitive. I really like the theory and when I’m sitting there waiting for something and I want to idly read some stuff for a few minutes, it’s always great to have it there. But then I realized that I don’t want to keep snacking. I want something more substantial. After a couple of years of flicking past interesting tidbits of info, I’m not feeling full. Blinkfeed needs to evolve, become something more substantial – and there was an attempt to do that here, with the service keeping an eye on where you are and the time, and showing you nearby restaurants and eateries that would be perfect for you based on Yelp recommendations. However, this option doesn’t seem to know anywhere in the UK, as it’s never once recommended a place to eat, although it is working well enough in the US. Either way, I don’t want it – the times when I fancy a place to eat that I’ve not tried are few, so the One M9 telling me what’s nearby each lunchtime isn’t going to be helpful. Ideally, this service should know the EXACT moments that I’ll be looking for a new place to eat (when calendar invites show lunch, for instance) rather than just generically. If it worked now, I’d have turned it off. The lockscreen does tell me when the sunset and sunrise is coming, which is nice. Always good to know when the vampires are going to be out. This isn’t something that’s particularly new, but for those of you thinking about upgrading from the HTC One M7 or other phone from 2013, the improvements on Sense are really cool. The lockscreen now shows information in strips which can be flipped away when not wanted, or double tapped to open in the relevant app. It’s a neat system, and shows Google and HTC have worked well together to integrate the option with Sense. In the pull down bar, there’s often a lot going on though. With Google Now just chucking information at you (you’ll get the option if you search for anything in the dedicated bar on the home screen) as well as apps telling you information, music widgets popping up and more, it’s quite busy. Another pull down will show the quick settings and the integration of all this together makes a lot of sense to me. It’s one of those things to be experienced rather than read about, but with a few minutes of use it all makes sense. Sense Home is one of the big things HTC is talking about with the One M9, a widget that lives on the home screen to show you the apps you use the most. The clever trick is that the phone will work out where Home, Work and the more generic ‘Out’ zones are, and populate the apps accordingly – and you can set these locations yourself. It generally works well too, although you can’t tell it to NOT put certain apps there – Tinder fans probably won’t want others to see that on the front screen. By default HTC has also lobbed ‘smart folders’ into the mix, showing suggested apps and those you’ve downloaded…. but these are really poor and should be switched off. The suggestions are random and the titles truncated – not what you’d expect from a flagship phone. I like the idea of having different apps for different times, and generally they were pretty good. However, I still found that after a week the eight slots weren’t filled with my most-used apps, so I hope this gets more accurate over time. Gestures are back from the HTC One M8, allowing you to wake the phone into certain modes when locked. The main gesture is double tapping the blank screen to unlock it, something Nokia invented and LG made popular. Given how hard it is to find the power button at times, this ability is useful – plus you can now double tap to turn the screen off too. Flicking up from the bottom of the display bypasses the lock screen altogether if you’ve not got security on, and when I remembered to use it I found it quite a useful ability. Plus you can drag down from the top or other side to open straight into voice dialing or Blinkfeed, although these are turned off by default. The main thing that’s annoyed me from last year is still there though: if the phone is asleep on the desk, you can’t wake it without picking it up or knocking the One M9 first. I’m sure the screen doesn’t stay constantly waiting for a tap or swipe input when asleep to save battery, but the LG range seems to be able to do it with better power management. But this gesture unlock is one of the best thing HTC has done in a while, and it should be applauded for keeping it present. While I don’t want it to sound like I’m bashing the One M9 too much in the interface section, the keyboard is another place where HTC has let a lead go. The brand used to be synonymous with an excellent and accurate keyboard, but it’s so far behind the likes of SwiftKey that it’s hard not to recommend you don’t download a better option from the Play Store as soon as possible. The accuracy is OK, but the word predictions are rarely correct. On top of that, the phone will only let you put in a word that’s not in the dictionary if you explicitly to so – and it won’t default to that the next time. It’s not terrible, but HTC used to be the best default keyboard on any phone, where now it’s just OK.
One thing HTC does do really well is make the phone section really easy to use, with the clever join between your contacts on handset and social networks almost seamless. For instance the smart linking between your friends on the phone and the profiles on Facebook and Twitter is excellent. And on top of that, the One M9 can pull in HD pictures from Facebook profiles so when you get called it’s not from a blurry, pixelated mess. It can take a while for the app to overwrite the fuzzy pictures with the HD options, but it will shake itself out eventually. Given phones like the iPhone 6 still can’t get close to this kind of happy integration (nor do they have smart dialing, where you can easily tap out numbers to get to friends’ profiles) so HTC should be applauded for this effort. The performance of the HTC One M9 is excellent, as noted. There are too many judders in this early version of the software that I anticipate will be ironed out in a very short time, but when it’s opening apps or searching the web everything is crisper than last year. I wish I could it say it would stay that way for the next two years that you’ll own this phone, but when you start filling it with apps you’ll get an inevitable slowdown as they start doing things in the background. Always keep things clean and safe, kids. A factory reset once in a while doesn’t hurt. The GeekBench 3 results show a very impressive score, and remember this isn’t really the full performance of the phone as HTC has throttled it slightly so it doesn’t go burning hot. That points out something huge about today’s phones: they’re pointlessly powerful. The octacore processor can be pushed to insane speeds if you don’t care too much about battery, but in day to day life it won’t hit anywhere close to that limit, meaning HTC can dial back the power without a worry. With that in mind, why does it matter how powerful the phone is? It’s like buying a high performance sports car that will never see the track. It’s good to know you’ve got that headroom to put your foot down when you want it, and the acceleration is great, but push it too hard and you’ll be in trouble. Even with the lower power, the HTC One M9 is the most powerful smartphone we’ve tested, only second to the insane skills of the iPad Air 2. For gaming, flying through multiple apps and more it’s got the power – but then when you’re trying to browse high resolution pictures in the gallery and it takes a second to load the fully sharp image, that experience is ruined. Shout out for call quality though – the ability to grab signal is very good indeed, which is even more impressive when you think how much metal is in this phone. Metal usually equals no phone signal at all, so it’s good to see that HTC has somehow managed to improve this area. I was a really big fan of using the One M9 to make something as old-fashioned as a phone call. Battery life on the HTC One M9 should be brilliant in comparison to what’s been before. The Snapdragon 801 chipset finally made an HTC phone decent at lasting throughout a day last year, and with a larger power pack and an improvement from Qualcomm things should be awesome. Sadly, they’re not. I’m not saying that it’s a problem and this phone won’t last long enough to tap out a couple of tweets, but the performance hasn’t been moved on much from last year. The issue is that the phone heats up really easily doing the most mundane of tasks. Anything that takes a little bit of wireless connection is a quick way to watch it drop, be it mobile data or listening to music over headphones. Where most phones these days won’t have much of an issue losing no more than 10% on my morning commute, even with a bit of video action, the One M9 has dropped as much as 17% through Bluetooth music streaming and emails, which is odd as this doesn’t usually munch too much power. The good news is Google’s new Android 5 gives you a good way of checking the problems, letting you shut down (or get rid of) the apps which are misbehaving. However, in this case it’s ‘Google Services’ which is the issue, elements fundamental to the running of the phone, which means there’s not a lot to be done about it. I usually see this in the first few days of reviewing, but the issue has pervaded. I do think it’s just early days for the software, something keeping the phone from going too deeply into sleep when nothing is happening. However that doesn’t mean you can lean on the One M9 too heavily for playing games or watching videos, which is irritating if you want to have a little bit of battery left at the end of the day. Gaming is really heavy on the battery, with a quick 15 minute game sometimes sucking 10% juice – although the issue is often than mobile games these days are constantly communicating with servers for online play or in app purchases, which hurts the battery. Running TechRadar’s standard battery test on the One M9, where we looped a 90 min full HD video at maximum brightness showed that the new HTC phone was one of the worst performers of recent times, with 31% of the battery disappearing. If you consider that the LG G Flex 2, another big phone on the market with the Snapdragon 810 chipset, only lost 13% in the same test, then you’ll see that there’s something going on with the software here. I also ran the same test on the newly-Lollipopped HTC One M8 and HTC One M7, and they managed 24% and 30% respectively – and the phone from 2013 had barely enough battery to make it through the day too. This shows that for some reason HTC has managed to go backwards in battery life, even with the larger capacity and theoretically more efficient processor. I’m confident battery life will improve, but it’s actually a small step back from the One M8, which can be had for nearly half the price of the new version, and that’s just not good enough. The other big thing here is QuickCharge 2.0 – although this offers a pretty amazing 60% charge in just 30 mins, the charger in the box isn’t QuickCharge enabled to get the maximum speeds on offer. This is just ludicrous – I thought by this point that they’d be standard as the tech began appearing in phones last year. It’s really frustrating that you’ll need to spend so much more given this is an already expensive phone. HTC’s given up on the Ultrapixel idea with the One M9, at least for its main camera. Instead it’s gone for the same 20.7MP sensor found in the Sony Xperia Z3, aiming to wow with the higher number of megapixels stuffed in. That step away from Ultrapixels is a big disappointment, as HTC was the one big Android brand striking out against the need for loads of pixels to take a good picture, instead going for the innovative combo of a 4MP sensor that could nab loads of light and a secondary sensor for clever effects. So how good is the new camera, trying to stand shoulder to shoulder with the best from Samsung and Sony? A good camera today needs to have a fast start up and shutter speed, excellent detail, accurate color reproduction and good low light performance, and it’s clear HTC has gone in hard for all of these. The One M9 generally has a very good performance in most conditions, whether it’s low light, bright scenes or changeable conditions. The sharpness of the pictures is clear and the color tone, although a little more muted, looks more mature than the over-coloration of the One M8. What’s clear is there’s a lot of post-processing going on throughout the photography process, and it’s very good for the most part. It’s evident that HTC has tried to offset the loss of low-light performance by boosting the exposure after the shutter is pressed – but this results in a lot of noise. The flash isn’t brilliant either, with the high power light taking over night pictures. The amber LED in there is designed to help improve skin tone, and while it does do that, the entire snap is a little over exposed. The big annoyances here, though, are the shutter speed (and, to an extent, the start up time, which is far behind the iPhone 6 and the Galaxy S6) and the time taken to autofocus as well. The biggest culprit was HDR mode, which forced the One M9 to pause for a while before even beginning to start processing the shot in darker conditions. Again, this isn’t the sort of thing I’d have expected from a next-generation processor. And the result, thanks to the lack of autofocus and the slow start to processing, is often muddy and lacks definition. So while low light performance has dipped appreciably, the general performance has more than improved enough to take its place. In general daylight, I was really impressed with the performance of the One M9. OK, it’s nothing different to the rest of the market, but it gives you quality and sharpness time and again. The field of view is lowered though, thanks to the higher number of megapixels. This means you don’t get as much info into the sensor, and where Apple is improving this year on year, HTC just took a step backwards to get more pixels into the mix. The front facing camera, now using the Ultrapixel sensor from the rear of the One M8, is miles better. It captures a huge amount of detail and really removes the need for a flash – something a lot of people have been calling for on other handsets. The beauty modes are still present, with the ability to smooth skin and increase the size of your eyes to a scary level. Face fusion, where you can work out what the demon spawn of you and your friend would look like, is also offered – and great fun down the bar. The other area that HTC has traditionally been strong is the after effects party, with the Zoe ability to take short videos and mix them with pictures a really cool trick. This year, Zoe has been moved to a separate app, been taken off as a camera option and been replaced in post processing with a lot of, well, useless effects. I don’t really get why HTC is making such a big deal about the ability to do things like double expose your photos – they just end up looking like you’ve messed up two snaps, unless they happen to perfectly complement one another. Similarly the prism and stripe effects, allowing you to ‘remix’ your image – it just seems like a good way to create a Pink Floyd album cover. It doesn’t make them look any better, and it’s certainly not something I’d share on social media and be proud of. One area that HTC has firmly wedged itself into is entertainment: whether that’s using the phone for watching movies, listening to music, playing games or even letting it control your whole media system, the One M9 is really rather good for all of these things. The BoomSound speakers should get the credit for a lot of things here, as they’re the reason that HTC has managed to bag the tag of being so good at audio. When I first heard what HTC was doing with these in 2013, I thought it was a stupid idea – making a phone better at playing sounds out loud was just going to appeal to the juvenile delinquents who play tinny music on a bus, right? But then I found that I would put music on when working at home, show YouTube video to friends and even use the handset without headphones when using guided exercise apps – things I’ve never done before with a standard phone. The sound is rich and loud, the extra space HTC allows meaning there’s a lot of room for the audio to echo and gain in timbre. In short, it worked – and even the internal BoomSound optimizations were smart. Using the technology again makes sense – I’m still not convinced that the speakers couldn’t have been made smaller in the same way as on other Desire devices in the HTC line. It seems this is equal parts branding as it is technology holding back – HTC wants the speakers to be seen to give the impression of a flagship phone. I get that, but a slightly sleeker device would have felt like a step forward this year. Enough of the look of the speakers though – how impressive is the audio capability of this phone? Very good, putting it simply. The HTC BoomSound integration with Dolby technology really does improve the quality of the music, whether with or without headphones. When listening to music through the speakers, the One M9 will automatically add a notification at the top of the screen to let you know which ‘mode’ the BoomSound speakers are pumping audio out in, either theater or music. It’s irritating that the phone doesn’t switch this automatically, as it’s clear that if you’re using Netflix you’ll need to be in theater mode, and if Spotify is up, then it’s music. Speaking of the streaming service, the music app on the One M9 is starting to feel a little redundant given the popularity of on-demand music, which explains why nothing has really changed of late with the app, apart from making it look more like the Google Play icon and thus causing confusion when selecting it in your apps menu. If you do have a full audio arsenal of MP3s to throw onto your One M9, then you’ll be pleased with the experience, as it’s got downloadable lyrics, clever visualizations and a bright and clear interface. There’s no hi-res audio on offer though, and this is starting to trickle through as something people are looking for in a phone. Both LG and Sony are making a big deal of it, and Tidal is growing in popularity as a high resolution streaming option. I don’t think HTC has missed out by not including it here, but it would have been a nice improvement. Watching video on the HTC One M9 is fine, although the automatic brightness settings are a little on the dim side. Even watching stuff in bed, where a low brightness is OK, I found that I wanted to keep pushing the clarity of the display up, which obviously affects battery life. HTC still hasn’t got a dedicated video app, so if you want to sideload any video onto the device then you’ll need to find it in the Gallery app or through Google Play Movies, but it’s not particularly onerous to do so. The sharpness and contrast ratios are impressive though, and if you’ve got the phone propped up somewhere then the BoomSound speakers make a nice addition. I’ve yet to notice anything coming close to Dolby virtual surround sound coming out of them when it comes to watching video though. To me, surround sound is when you have moments where you’re not sure if there’s someone approaching to the side – all I felt here was that the dialogue was clearer. That’s not a bad thing, but don’t get excited and think that buying this phone will replace a home cinema system. Then again if you did, I’d worry for your sanity. HTC’s SenseTV app has disappeared, to be replaced by the Peel Smart Remote option. Given this was the power behind the app originally, it makes sense that HTC should cease bothering putting its own skin on and let the current app do the talking. It’s an odd app in terms of quality, ranging from the sublime to the ridiculous. When displaying what shows are on, or those you might like, the pictures look low res and stretched as it pulls them from the local channel servers. Given this is one of the first things you’ll see when turning on the app it won’t fill you with glee. But go a little further and you’ll see that this is a very powerful app indeed. The set up for the main TVs couldn’t be easier, and by simply entering your post code the channels are almost always spot on. In less than 30 seconds of powering up the app you can be browsing channels and watching a TV that you’ve not been able to use remotely for years (we’ve all got one where the remote has been missing for a while, right?) and setting up a TV from a big brand is speed personified. The interface is slick and easy to use, and the ability to call up the EPG on the remote screen is really cool. Plus I can never tire of pressing a button for a channel and watching the phone press all the buttons in the right order to make sure that the right pictures pop up. Who doesn’t like automation like that? One annoying thing that kept happening was the fact programs I’d just watched and decided not to continue with remained in the notification bar, even if the app was closed down. I’d wager that HTC’s biggest problem here is letting people know that their phone is such a powerful remote. Given so many people asked me what the top section of dark plastic was for on the phone, it’s clear not many know that this is a device with an infrared blaster packed in. But if that’s HTC’s hardest problem to solve then it’s not a bad thing at all. The Adreno 430 GPU in the HTC One M9 is definitely strong enough to be one of the better options on the market for general gaming – in fact, there’s very little that can’t be thrown at it that will cause the phone to crash or stutter. That means you can play something like Real Racing 3 or Into the Dead and combine it with the rich sound from the BoomSound speakers to get a really decent experience, and the sensitivity of the touchscreen is something that makes it a real joy to use. Sadly I’m still yet to find a phone that really does let me use it as a console, with an easy connection to the TV with a Bluetooth controller attached. What fails to work here is the latency: connecting the phone wirelessly or through a MHL lead (which is supported) still results a slightly laggy experience if you’ve got a controller attached through Bluetooth on the phone, so all that raw power can’t be exploited. As a mobile gaming unit it’s pretty good – as long as you can handle the dramatic loss in battery power – and I’ve not found much incompatibility for titles on the One M9. The HTC One M9 is a very good phone, mostly let down by the fact the one from last year was brilliant. The only reason it’s judged so harshly is the fact that in 2015 it’s got so many other brilliant phones to steal its thunder – so if you’re looking for an alternative, these are the ones to look at. The Galaxy S6 is definitely the phone that most HTC users will be thinking about instead, especially if they’re into the Android ecosystem. While HTC managed to reboot its ailing flagship franchise two years ago, it’s taken Samsung until now to manage the same thing – and boy, has it done it. There’s nothing particularly outstanding about the S6, but it manages to do everything very well. The camera is feature-packed and powerful, with a clever 16MP low-light sensor. The processor is built in house and is hyper-powerful, and the QHD screen seems to actually be half decent. However, that’s likely more to do with the Super AMOLED technology underpinning than the crystal clear resolution on offer – after all, there’s only so much sharpness the human eye can discern. It doesn’t stop images looking amazing on it though. There are some drawbacks: the battery is only average, although still seems to last longer than the one on the One M9 and it costs a little more than HTC’s flagship. If I was going to recommend a phone over the One M9, the iPhone 6 would be it as they’re so alike in terms of design prowess – and even the price has evened out. However, the similarity is only in the effort put into build quality, as where the One M9 is well balanced and weighty, the iPhone 6 is very light and flat. It still feels very much like a premium phone, and although the screen isn’t as sharp, it still looks gorgeous to the point of not really noticing unless you compare. In terms of the app selection and the general performance, it’s on a par with the One M9, and the battery life is very similar too. It really comes down to whether you want to pay the extra cash and if you’re an iPhan – if not, the build quality and general luster of HTC’s option is excellent. And we come to my biggest issue, that the predecessor to the One M9 is actually a little bit better. While it does lack in terms of spec, it manages to more than make up for it in cost, coming in between half and two thirds the price of the One M9 on contract. And I can’t really say what’s that much worse with it. The battery life is actually a touch better, the build quality not miles away and the camera not terrible in comparison. OK, the new 20.7MP camera on the One M9 is stronger, but it doesn’t have the innovative Duo Camera sensor for really cool effects. I’m pretty sure the Sense experience from the One M9 will make its way to this device soon too – so really, with the same screen, a more palatable price and a little longer in the battery, is this actually the better phone? The LG range is always going to be a thorn in HTC’s side, as it can offer a premium smartphone experience for a lower price, as it channels its marketing budget back into the phone’s cost. The QHD screen is the real talking point here, but it doesn’t really offer than much more than HTC does, and the build quality of the new HTC flagship far outstrips the faux-metal of LG’s best. The LG G4 will obviously give HTC a much better run for its money, but the G3 is still a solid option given it’s a very cheap handset for the tech inside. With a few months left until the Sony Xperia Z4 emerges, last year’s Z3 is the closest challenger to HTC’s One M9 – although in my eyes there’s very little competition. It has price as a winner, and despite packing a very similar sensor the camera performance is superior from Sony thanks to better optimization. It’s also got a longer battery life too, thanks to the enhanced Stamina Mode. But it’s in the interface and design that HTC is the winner here, as it’s got a much better way of bringing the cool bits of the phone to the surface through BlinkFeed and clever notifications at the right time. I think the Z4 will be a very powerful phone when it emerges, and should have a real chance of impressing ahead of the One M9, which by then will be a few months old. For me, a flagship phone needs to hit a lot of marks to be considered impressive: it has to have cutting-edge performance, beautiful design, a powerful camera, long battery life and not be too hard on the pocket. Last year HTC hit nearly all these marks, with the One M8 excelling in every area. OK, it wasn’t cheap, but nor was it the most expensive on the market. It didn’t have the best camera, but it was the most innovative. This year, HTC isn’t at the top of any of those categories apart from design, where it still shows the rest of the market how it should be done. It’s raised the price by nearly 8% and yet doesn’t deliver any discernible upgrades beyond a more mature camera and slightly more professional speakers. It’s all nuanced tweaks, not powerful improvements. I think I’m most disappointed by the camera used here. I was expected HTC to come out all guns blazing, showing us that it really did believe the megapixel myth was something to be fought, that lower MP counts really do count for something. Instead of the next generation of duo camera, an 8MP Ultrapixel sensor or similar, it seems to have thrown in the towel and decided to try and make more megapixels work… you know, just like everyone else. This is a phone that has all the DNA of the HTC One M8 and polishes it well. Theme creator adds a lot of personalization to create an emotional attachment with the phone, and the Sense Home widget seems to be a really useful too. I thought I’d be getting rid of it straight away as I’ve seen this tried over and over again by other brands, but it’s actually useful and surfaces the best stuff at the right time. The main thing I liked is the design though. It’s easily the best on the market, feeling almost hand-crafted with a great aesthetic and great feeling in the hand – this is the One range grown up. And while things like BoomSound, Blinkfeed and Sense haven’t necessarily been improved much, they’re still really great features that HTC is rightly proud of, showing it’s still a market leading brand. Sadly, there’s more to criticize this year than I’ve had in the last couple of years. The first is the battery: I’m expecting next generation power management in 2015, as most of the smartphone buying world is, and instead I get something that’s a step backwards. That’s a reduction in power with no discernible reason either – the full HD screen isn’t any different from last year, the battery is bigger and the software presumably stable. So why on earth are we not seeing at least 36 hours of battery life where I’m not even getting a day? The camera is more powerful than I was expecting but I’m still disappointed in the loss of the Ultrapixel and duo camera combo. I wanted to see an 8MP advance on last year, maintaining the strong snapping speed, and instead I got a sensor with the same specs as the one Sony’s been pushing for over a year – although it does take some great pics on occasion. The biggest issue I have with the One M9 is that it doesn’t impress me as other models have. Good design is fine, but it seems like HTC’s just remade the phone from last year as it didn’t have anything new to add into the mix. Taking the DNA from the One M7 and One M8 doesn’t mean that’s fine for a new handset. Let me make one thing clear: the HTC One M9 is an excellent phone, filled to the brim with good features, a clever interface and a design that it should rightly be proud of, once again showing every other brand how it should be done. The issue is that it doesn’t improve enough. The One M8 was pretty much the perfect phone, and not much has changed year on year… in fact, HTC has gone backwards on battery life and hasn’t really done much more than polish throughout the phone. Except perhaps in the camera, where things are improved and needed to be given that was somewhere HTC was struggling to gain consumer support. It’s now just the same experience as on every other phone though, and I miss last year’s innovation. HTC hasn’t been as arrogant as Apple by simply bringing out an S version of its phone though – there are some genuine upgrades, which are evident the second you put the One M9 in the hand. It makes the design of last year’s model look sloppy in comparison, for instance. This is a phone sold on precision, but comes with far too many ragged edges to be considered worthy of a perfect score again. It’s all tweaks and polish, an admission that HTC managed to create something brilliant last year and is loathe to deviate too far from that formula. Which is a shame, as this is a brand I’ve almost come to rely upon to offer genuinely useful innovation time and again. Fingers crossed 2016 will see something from HTC that lives up to that ideal. But this year we’ve just got a good phone – a pretty darn good one – but not brilliant.